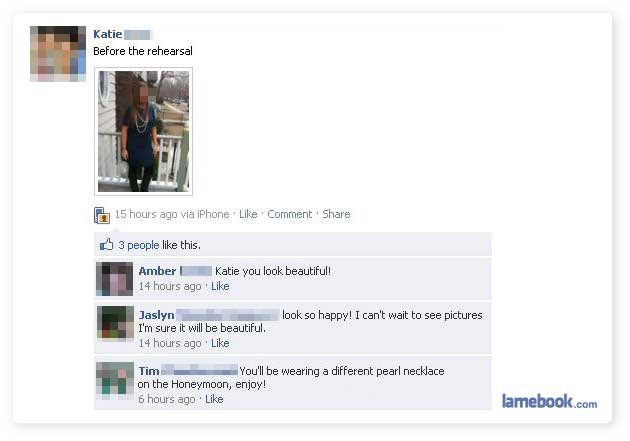 Lamebook – Funny Facebook Statuses, Fails, LOLs and More – The Original » Share Time! Yep haha, big name hide fail. Too bad she seems kinda boring. There are only 3 of them, and given that she left her friends list public and Amber is near the top, it’s easy to spot her. Looks boring as someone else mentioned. 100 friend requests, celine? I seriously, seriously doubt that. What’s with all the stalking of people on their facebook pages lately? When did that become acceptable. I thought most FBers had a little more class…or at least they used to. Hasn’t this site proved to you yet, that FBers have no class? ?